Little Wonder has a long and illustrious reputation as a gardening equipment and hedge trimmer specialist, and the company has been making high-quality products since it was founded in the United Kingdom in 1922. This is the company which proudly created the very first hedge trimmer in the world in the same year. Also named the “Little Wonder,” this early model was a somewhat laborious hand-cranked hedge trimmer. In 1935, the Little Wonder brand found its way to America and has been creating premium hedge trimmers and other equipment there ever since. Looking for a new hedge trimmer? We have listed the best choices out of the current most popular brands and models on this page. Click on this link to get there. Little Wonder is a well-known manufacturer of outdoor tools such as blowers, brush cutters, edgers, truck loaders, vacuums and hedge trimmers. They celebrated 95 years as a company in 2017, proving that the company is more than capable of standing the test of time. The Little Wonder company has been responsible for introducing numerous landscaping-related products on to the market and is justifiably proud of this pioneering tradition. They produced the very first electric-powered hedge trimmer back in 1940 and followed this with the first gas-powered model in 1955. 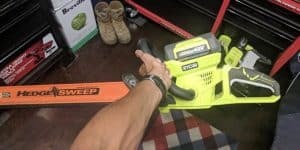 Anyone who has used a hedge trimmer knows what a huge hassle it would be to clean up their lawn or other outdoor areas without these useful tools. The hedge trimmers today allow people to get their tasks completed in a fraction of the time, with a fraction of the effort. Both gasoline- and electricity-powered models are still overwhelmingly popular with American consumers today with both offering different advantages depending on the consumer’s particular needs. It is very clear that Little Wonder is a long and very well-established market leader and innovator when it comes to the creation of high-quality garden equipment such as hedge trimmers, and it is also clear why they remain the No. 1 choice for American landscaping professionals. Little Wonder has built its reputation on its incredibly strong and durable blades, and it is their unwavering commitment to maintaining quality levels that has made them a market leader for a century. 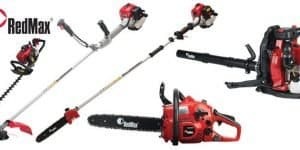 This is not a company which claims to offer budget options in terms of either hedge trimmers or other products, but instead is one which prides itself on its super high-quality products and long record of trusted excellence when it comes to outdoor equipment. Little Wonder began as a company in the United Kingdom in 1922, creating its first hedge trimmer. At the time, this trimmer was hand cranked. It didn’t have the electric, battery or gas power that today’s hedge trimmer models offer. Surprisingly, the trimmer found a high level of popularity with people who make pasta. They would use the trimmers to slice the pasta into strips. Coming to America in 1935, Little Wonder was quick to set up shop, beginning with the world’s very first electric hedge trimmer in 1940. This was a huge change to the market as those who used the trimmer no longer had to fuel it through their own efforts. It made trimming a whole lot easier. Fifteen years after that, Little Wonder followed up their success with the world’s first gas-powered trimmer in 1955. Since then, the company has experienced huge levels of success. Today, Little Wonder products are sold by dealers all over. In many cases, they can be found in more local outdoor supply shops which is wonderful if you aren’t a fan of the big brand name stores. You might think this would keep the brand from becoming incredibly popular, but there are a lot of important places where these tools are used. Most importantly, Little Wonder tools have been known to be used at the White House. They are also used at what we know to be the happiest place on earth, Disneyland. That’s a lot of brand representation! You can often tell Little Wonder tools apart from others by their telltale red and white coloring. 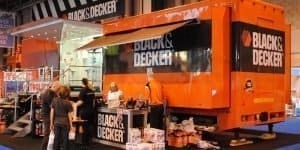 This gives their products a design that allows people to recognize their branding right away. Many brands have a particular color scheme so that they can be told apart, and so that when potential customers see a tool that is working well they can see right away what brand they need to go to in order to find that tool. It’s great marketing all around! Little Wonder gas-powered hedge trimmers guarantee users super sharp cuts each and every time. They each boast a commercial grade 21.22cc engine complete with electronic ignition, and feature industry-renowned blades which have been proven to last up to 10 times as long as their cheaper counterparts. Each model comes equipped with fully integrated dual reciprocating blades for reduced vibration, in addition to a state-of-the-art centrifugal clutch. Furthermore, a bar offers increased support and a primer bulb carburetor allows for easy starts. Each unit is ultra-lightweight in design for an enhanced user experience. These models are suitable for both commercial and domestic use. The Little Wonder Gas Hedge Trimmer is built to reduce vibration with special shock mounts that have been attached to the handles. This helps you stay comfortable as you work. Little Wonder electric hedge trimmers feature double blades for a faster and less labor intensive hedge cutting experience every time. Totally emission free, these models are also lightweight for superior ease of use. They also offer the same outstandingly strong blade power as their gas-powered counterparts. Electric models come with a choice of single or double blades, and other great features of these models include the ability to deal with evergreen hedge growth of up to ½” in diameter, with fully integrated case-hardened steel gears as standard. These models also offer angled gear teeth for increased power, and dual switch blade engagement for added safety. 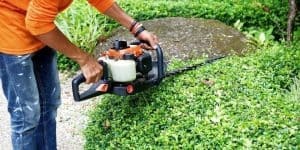 Unlike gasoline powered models, electric hedge trimmers are obviously corded, but come fully equipped with a safety conscious cord management system to keep it from coming unplugged during use and to keep you safe at all times. These models are also comfortable to use for extended periods of use due to their ergonomically designed handles. Regardless of whether you choose a gas- or electric-powered hedge trimmer from the Little Wonder brand, you can be guaranteed of a superior user experience. With 100 years of tradition behind each hedge trimmer they sell, Little Wonder branded models will give you the power to maintain your yard beautifully with absolute ease. From its beginnings in the United Kingdom almost century ago, it has grown to become one of the most well-established and respected outdoor equipment companies in America with its high-quality and durable hedge trimmers the No. 1 choice for both professionals and anyone who wants a beautiful outdoor space. Just below we have listed the only electric hedge trimmer Little Wonder currently sells, albeit under a different brand name, Mantis.